After years of posting about the total unaccountability and basic untrustworthiness of the Sathya Sai Central Trust during which not a soul in India responded to my documented details or sound arguments, the authorities and the media there have at last taken the matter up, vindicating all my worst suspicions. Such well-founded articles as ‘Can We Trust the Central Trust’ by Serguei Badaev, the former leader of the Sathya Sai Organization in Moscow have been ignored by Indian newspaper editors of major newspapers there to whom they have been sent, and almost everyone else too! Devotees are indoctrinated and pressured to never think ill of anyone, or criticize anyone at all (as everyone is supposed to be God!) and especially not of Sathya Sai Baba or any of his officials! The current revelations about the total lack of external control or even filed information show just how damaging is this simplistic ‘three monkeys’ proverb that SB loves to reiterate (and devotees love yet more to parrot). As Barry Pittard had stated so pungently, this press cover-up or sheer laxity is a signal to most Indian media to buck up. The Times of India continued:-. “Official sources said that in 1980 the Sathya Sai Trust, which has Saibaba as its chairman, had requested the state government to grant exemption from statutory filing of reports to the endowments department, which was duly conceded by the then Congress government. As per the Indian Trust Act, trusts should submit a report to the state government concerned once at least every three years. However, thanks to the exemption granted by the state, the Sathya Sai Central Trust. a leading religious, educational and cultural organisation which receives large amounts of foreign donations, has been ﬁling only the foreign contribution report under the Foreign Contribution Regulation Act to the union home ministry every year. According to the union home ministry sources, the Sathya Sai Trust ﬁled its report for 2009 about three months back. As per the submissions, the Trust received Rs 95 crore as foreign contribution in 2003-04, Rs 47.7 crore In 1996-97, Rs 42.9 crore in 1997-98, Rs 39.8 crore in 1998-99 and Rs 50.2 crore in 1999-2000. In 2001-02, the trust received Rs 88.18 crore as foreign contributions. NOTE! DR. JOHN HISLOP DIED IN THE 1990s Goldstein has never been listed as a director before, nor Tigrett but they may be. Since it was first started, the Sathya Sai Central Trust has both gained and lost a number of members – referred to as ‘directors’. Those who have either been dismissed by Sai Baba (for embezzlement and other corruption) include Mr. Prasdad of Bangalore, Colonel Joga Rao (Sai Baba’s main engineer and accomplice, removed for taking too many kickbacks from contractors). Mr. Narayan (former head of the ashram – sacked for having built a luxury villa in Bangalore he reportedly financed by embezzlement of funds). 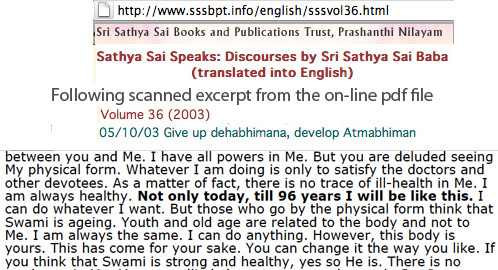 Sathya Sai Baba 96 years old? When the blog below was written he had not yet died. Since he died on Apl. 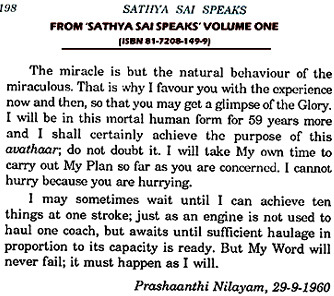 24th, an ‘explanatory rationalization’ was issued by the Sathya Sai official website claiming that he DID live to 96 years… umm well, not exactly, only to 94.4 years. These years they claim were ‘lunar years’, and that SB used to reckon in lunar years (nothing of the kind has ever been published before – he always used calendar years. However, to try to make the figures stack up somewhat (i.e. to 94.4 years) they used an entirely false premise – that the moon orbits the earth every 27 or so days, when in fact it is 29 or 30 (depending on timings of passage) When the lunar year are reckoned correctly, it turn out he had lived through 89 or 90 lunar years only. This ploy was obviously intended to pacify devotees who were distraught with tear etc., but also to limit the damage from people leaving and no longer donating, especially foreigners. So his last birthday – the 85th – was not the 85th? Make what you can of that and see the fuller analysis of the facts and bogus explanation here. When will Sathya Sai Baba die – aged 96, or 92, or very shortly at 86? 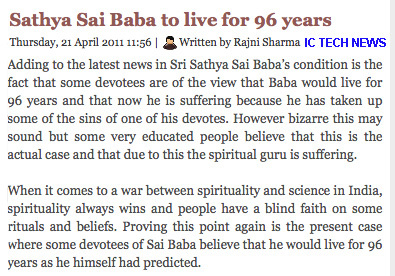 The prophesy Sai Baba allegedly made about himself ‘leaving his body’ at the age of 96 was reported by several devotee writers as the age 95 and/or 96 (in some places in India a person who is 95, yet is in-the 96th year, is said to be 96 years old.) On various occasions Baba has reportedly said in private that his life would last 96 years [eg by S. Balu, ‘Living Divinity’ London: Sawbridge Enterprises, 1981, p. 29]. That he so said was not properly documented until he stated this finally in a discourse in 2000. Not, that is, unless one trusts the account of Mr. V. Balu of Bangalore, whose book ‘The Glory of Puttaparthi’ made the claim in the 1980s that Sai Baba had foretold this. The great majority of followers now still believe that he will live for 96 years. However, according to Sai Baba’s previous published statements (see inset scan) he would leave the body at the age of 93 or 94 maximum. Since then Ratan Lal told our friend Anne Irene who knew her very well that Sai Baba had repeated the prediction of 96 years personally to Ratan Lal. Moreover, Sai Baba had also told him that it was nobody’s business when he would leave the body – he could even prolong his life if he deemed necessary! It certainly seems he was covering himself for whenever it actually happens, But not, as we now see, the present situation. “He’s going to die on his 95-year anniversary, ” said Dr. A. Murthi, who sitting in the organizing committee for the World Conference and is a sworn devotee of Sai Baba. – How can Sai Baba know? – Because he is the son of God. Son of God knows everything. – It will say that Sai Baba has a good 20 years left to live? – Exactly. And during these 20 years we must solve a series of problems. So what about when his prophecies are so self-contradictory? Which age will it be? Ninety-two, Ninety-three, Ninety-five, Ninety-six? Or whenever he sees fit? It is interesting too that no Indian astrologer who has made predictions about Sathya Sai Baba is known to have given the date of his death… though most of them they do this with great confidence for anyone who wants! Apropos, Mr. Ratan Lal – now deceased – was one of Baba’s long-term close followers, a resident at PN who held lectures there (incidentally, on an self-defeating inconsistent amalgam of Sathya Sai Baba and Ramana Maharshi’s teachings, which can be seen for what it is in his published books of the same, edited heavily to make them better by none other than Anne Irene Larsen, now very much an ex-devotee of Sai Baba). Ratan Lal was short of stature and sometimes had a typical bossy manner on those who, like him, had donned the role of some kind of spiritual lecturer after retiring as a businessman. Our friend Anne-Irene Larsen also helped me with investigation about Sathya Sai Baba’s alleged sexual abuses when she stayed for a long period at Prashanthi Nilayam and other ashrams. These included the Ramana Maharshi ashram at Tiruvannamalai, where a Hungarian ex-Sai devotee lady was staying, having been at Prashanthi for four years. This lady told Anne-Irene that she had talked with several sexually abused students there and that this had been the last straw in her decision to leaves Sai Baba. Mr. Ratan Lal confirmed to Anne-Irene when asked that a formerly very prominent Greek devotee family there had immediately withdrawn their son (called Socrates) from the college when they learned he had been sexually abused by Sai Baba. However, Ratan Lal explained this away by saying the Greek father had too big an ego, so could not stand the proximity to the Lord! Anne-Irene also knew well the foreign lady called Veronica, who ran the foreigners’ canteen and who was known for reporting to the Sai officials young men who claimed they had been sexually molested, who were blacklisted and thrown out immediately without notice with police intervention. As also was Dr. Naresh Bhatia, among many others through the years. While Sathya Sai Baba supposedly reclines eternally as the God Vishnu on his serpent bed on the sea of milk in Vaikunta (as they believe) down here he is almost a corpse and no doubt would be one, were it not for the tubes and machines keeping organs functioning peripherally. Despite all the prayers of however many devotees, it’s only a matter of time… and not long either, take note! Meanwhile, there are increasing leaks from a major upheaval taking place behind the scenes in the ‘corridors of power’ and it all has to do with the heart of this “avatar’s” mission – the Sathya Sai Central Trust. Rumblings that reach me from insiders in India announce that the Indian and/or Andhra Pradesh governments have been snooping on its activities for years – probably with the aid of moles – for it is a major player in the foreign exchange earnings situation, having been the biggest single earner of foreign currency for India for decades. More laughably, Ratnakara concludes with the self-defeating statement: “The trustees and the members of the council of management, including the Secretary of Sri Sathya Sai Central Trust deeply appreciate and are gratified by the strong and vigorous support extended to, and the confidence expressed in them, by one and all.” One and all? Which ‘all’? The Times report states further, “Referring to the allegation that Baba was under sedation for long, he said if that was the case then why was the government silent all these days and an inquiry not ordered into it. What is causing concern is why the government is showing more interest in the assets of Baba than his health ever since he was admitted to the hospital on March 28. The government did not even consider necessary to call for a team of expert doctors from AIIMS. What is also not clear is why the team of doctors, led by Dr Raviraj, was recalled. 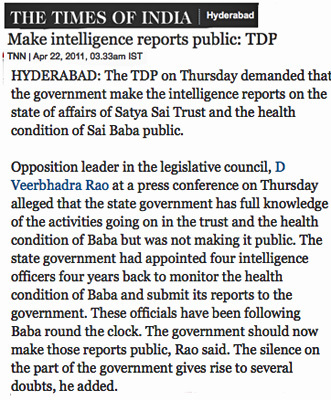 The government also needs to explain as to what happened to the earlier medical reports of Baba’s health,“ Rao said and demanded that the video footage of Baba’s health condition be made public immediately.” (Note AIIMS = All India Institute of Medical Science). Indeed, the treatment SB has received as reported seems – in view of the many rapidly changing and conflicting reports from doctors and/or minders – to have been below what one should expect from such a huge array of doctors and specialists as were stated to have had a hand. 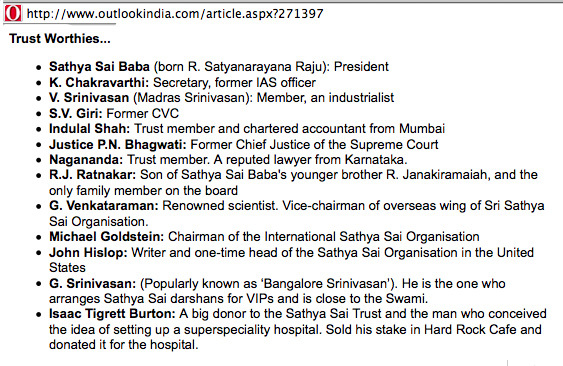 Knowing of the authoritarian methods of all Sai officials, and particularly Dr. Safaya, I was once informed at length by one of his anaesthetists from Australia (Dr. Sara Pavan), it is likely that specialists from elsewhere have been kept at arms’ length from SB and used only as advisors at best. Add to this that there have through the years been diverse reports of bungling at the Sathya Sai “Super-speciality” hospitals – wrong injections and incorrect medications, not to mention disregard for professional hygiene.